In those days Jesus came from Nazareth of Galilee (like there's any other Nazareth), seeking out John the Southern Baptist. 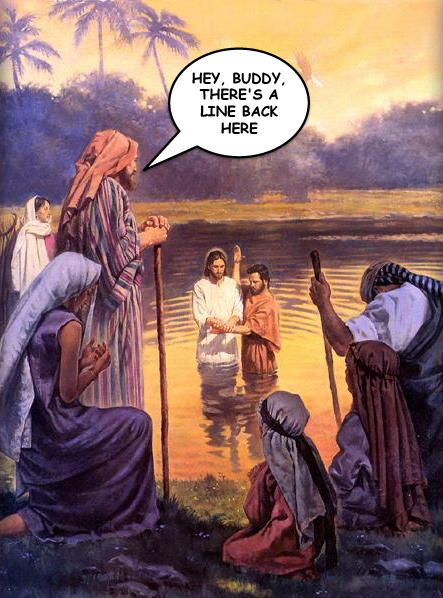 Jesus found John at the Jordan river, and there was a long line of people waiting for John to baptize them. So Jesus waltzed out into the river, just as pretty as you please, cutting ahead of everyone. Then Jesus flashed his baby blues at John as if to say "C'mon. Do me next. I'm The One and all." So John forgave Jesus for his sins - including butting in line - and baptized him. Just as he was coming up out of the water, Jesus saw the heavens torn apart and a Spirit coming down on him like a dove. And a voice came from heaven, "Congratulations, you are the ten thousandth baptizee. Therefore, you are my Son, the Beloved. With you I am well pleased. No pressure." And Jesus said, "Wow. I didn't see that coming." The next man in line was totally bummed because he realized he should have been the ten thousandth baptizee, the Beloved, and so on. As Jesus waded out of the Jordan, he smiled at the man and said "Tough break. Maybe next time." And Jesus's Spirit immediately drove him out into the wilderness. Like a dove. "Forgive this man Jesus for his sins."